The simply supported beam shown in Fig. 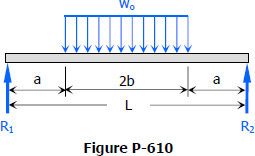 P-610 carries a uniform load of intensity wo symmetrically distributed over part of its length. Determine the maximum deflection δ and check your result by letting a = 0 and comparing with the answer to Problem 606.